NEW YORK, New York — The Hayastan All-Armenian Fund is building a natural gas system in Artsni, a village in Armenia’s Lori Region. The project is sponsored by the Fund’s German affiliate. With the construction of a 1.3-kilometer gas pipeline completed, the Fund is currently building a 5.5-kilometer internal network, which will supply gas to the some 100 households of the community. 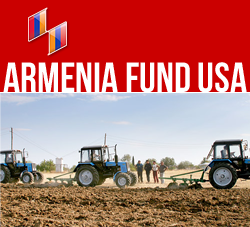 Artsni is among the numerous success stories of the Hayastan All-Armenian Fund’s Rural Development Program. To date, the Fund’s work in the village has yielded a modern school; a community center comprising the mayor’s office, a health clinic, a library, and an events hall; as well as last year’s provision of school supplies to children in Artsni and neighboring Dzoramut. In addition, the Fund built a 550-meter section of a 2.3-kilometer water main, which was constructed with support from the International Fund for Agricultural Development. The section built by the Hayastan All-Armenian Fund connected the Artsni school and the community center to the water network. Most of Artsni’s 350 residents are refugees from Getashen. Cattle-breeding is the community’s main occupation. It is located 62 kilometers from the center of the Lori Region and less than half a mile from the Georgian border.